Home > Apologetics Topics > Philosophical Questions > Is There An Answer for David Hume on Miracles? I was surprised by your defense of the value of eyewitnesses. It's not up to your regular level of scholarship. 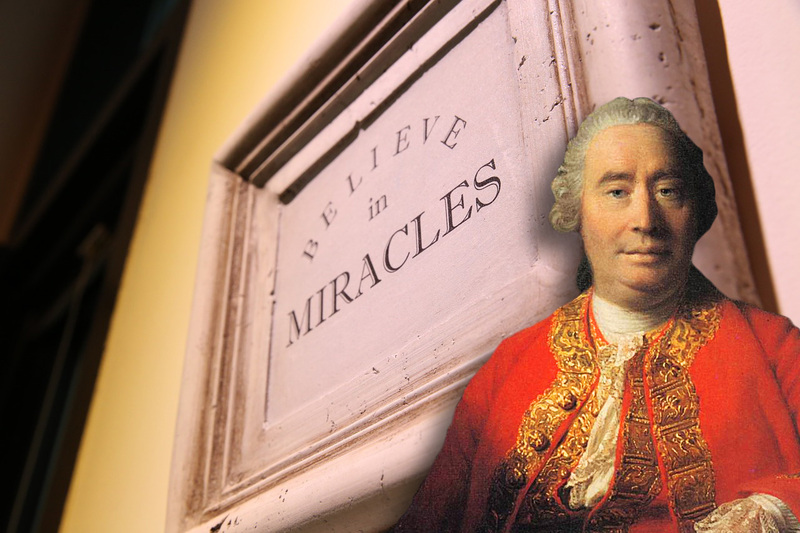 You should review David Hume's "On Miracles" (from an Inquiry Concerning Human Understanding). In short, no amount of personal testimony is sufficient to establish a violation of natural law (or even the presence of natural law). Physicists don't believe the facts of physics because of personal testimony from other physicists; rather, they believe because they can do the experiment for themselves. Furthermore, if you don't believe, you can do the experiment and see for yourself. No lesser standard of proof is acceptable for scientific explanations of the world. In fact, Hume argues that miracles are by definition unbelievable. He writes, "A miracle is a violation of the laws of nature. There must, therefore, be a uniform experience against every miraculous event, otherwise the event would not merit that appellation. And as a uniform experience amounts to a proof, there is here a direct and full proof, from the nature of the fact, against the existence of any miracle.1" Hume further argues that because the only evidence offered for miracles is eyewitness testimony, and eyewitnesses have been know to be wrong, any reasonable man would assume the eyewitness testimony in error rather than believe an abrogation of something as consistent throughout time as natural law. The probabilities demand it! As I said, Hume's argument seems quite formidable- but it's not without its problems. Whenever someone asks if miracles are probable (or believable) they are really asking is there a God, and that is the crux of the problem. You see, Hume at the start of his inquiry dismisses God as a criterion for support. Hume says we should judge miracles only on the basis of natural evidence - what we find occurring in nature as repeatable. The less common an instance, the less rational it is to believe. If one assumes that nature is the standard for judging the reasonableness of an event occurring, then Hume may have a point. But by assuming this, one assumes there is no God that rules over nature. What he does is in effect is beg the question. The Bible asserts that an omnipotent God created the universe ex nihilo and governs natural laws. A suspension of natural laws is a definition of a miracle. Therefore if the God of Christianity exists, He can perform miracles. Using the above argument, one can see that miracles are not placed outside the realm of logic as Hume would have it. The question really becomes does the God of the Bible exist. The other problem with Hume's argument is it is so sweeping in scope; it proves too much. According to Hume, any event that would be considered singular in nature (unrepeatable) is by definition irrational to hold. Yet, this cannot be. Take for example the creation of the universe. The universe began to exist or it has existed for infinity. Now, an infinitely existing universe is illogical 2. However, Hume would state that a universe that had a beginning is also illogical. Thus we are left with a quandary of only two choices available to us, neither being reasonable by Hume's standards. Yet the universe is here and it is in time! It did have a beginning. Therefore, Hume must be wrong. I hope you can see that a belief in miracles is not illogical at all. Hume has made an argument that starts with a denial of a God who can work outside nature, then he goes on to argue that it is unreasonable to believe in violating nature's laws because it is unusual. But, we have seen that both counts of this argument are flawed. I pray that you will continue to investigate the truth-claims of Christianity. Weigh the evidence for the resurrection and see if it can stand an objective study. 1 Hume, David. An Enquiry Concerning Human Understanding. The Harvard Classics. 1909–14. 2 - I lay out the argument for why an infinitely long universe is illogical in my article "The Kalam Cosmological Argument". For a more in-depth treatment, you may also see "The Existence of God and the Beginning of the Universe" by William Lane Craig at http://www.leaderu.com/truth/3truth11.html. 3 - Geisler, Norman "Miracles & The Modern Mind" In Defense of Miracles Geivett & Habermas, Ed.